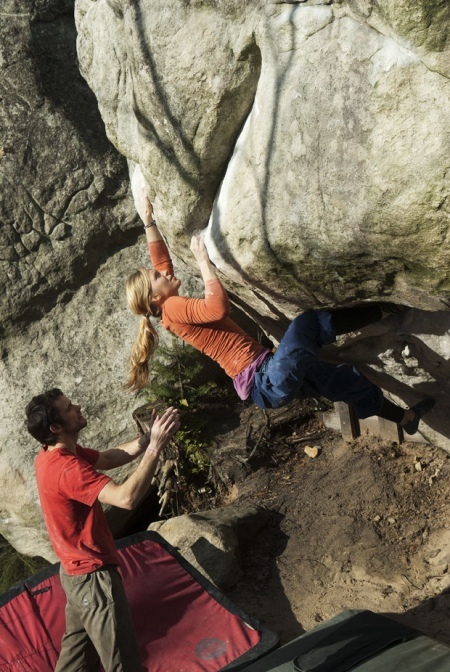 After the joys of a decadent festive season in London I headed out with friends to Fontainebleau to celebrate the New Year and do some bouldering. As we drove there, it was raining; when we got there, it was raining; and for the first four days, it rained. Fontainebleau is an amazing climbing venue, one of the best in the world but the one thing that brings it down is the weather. During our trip of seven days we had two and a half days climbing, which is better than nothing and worth the wait. I was lucky enough to try Irreversible, a high ball 7C at Manoury. It is a great line, a bit scary and brilliant climbing. After taking two falls from the last hard move, I finished the climb with my heart in my mouth and my hands a bit shaky! On the last day of the trip I went back to try again on Big Golden at Cuvier Rempart. I had tried this climb one afternoon earlier in the trip and was astonished to find I could now do some moves on it that I had, on previous trips to Font, never managed. Filled with psyche I tried to piece it together and, after a last change in beta, I found myself topping out. Very happy, I really thought I may never do this problem. Back in the UK, the weather has suddenly turned nice. Blue skies and cold air inspired me to head out to a grit problem I had failed on a year or so ago – Suavito (7B). 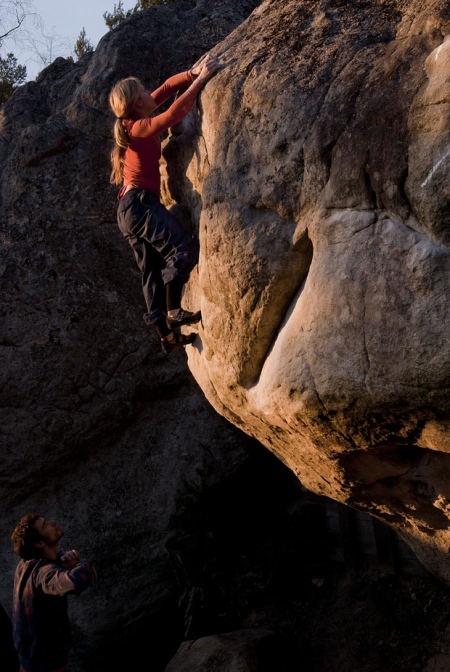 This problem is fairly high and committing at the top, requiring a big throw and a big span. I was psyched to try it again and this time (after one fall landing flat on my back!) I managed to climb it. Hopefully this weather will continue…..